As she spoke of their London townhouse, Georgette felt her throat tighten. For the first time since the terrible news had been delivered, she rather feared that she might cry. In her mind’s eye, she was looking up at the huge house with its white stone frontage and great columns either side of an immense black door. There were four floors to the great house and windows everywhere. She could hardly believe that it would very soon no longer be her home. And what of the staff? Her father had kept a butler and housekeeper, a valet, a cook, and two maids. Not to mention a stable-hand. “Perhaps not impossible,” Mr Wharton said, but Georgette could tell from his tone that he was simply trying to soothe her. For Georgette knew that it was impossible. Even if she had hoped to marry for love, still there would have been certain expectations of finance, status, and class that any future husband would expect. Of course, had she already been well on her way to marriage, it would likely not have been an issue. However, to actually tempt a young man into matrimony when she had nothing to offer but her homeless and penniless status would be impossible. Not only that but where was she to meet such a young man now? Despite the fact that she was the daughter of a minor baron, the Honorable Miss Georgette Darrington, no less, still, she had nothing. And her title was so minor that it would not matter to anybody, and she would probably do well to forget it. In truth, it was barely a title at all. The ageing attorney rose from the seat behind his desk and strode towards the door of his office. When he opened it, Georgette could hear him speaking to the housekeeper and asking for some tea to be sent in. In truth, Georgette thought that she would hardly be able to swallow the tea, even if she tried. For a few moments, Georgette simply looked around the austere office. She wondered if she would ever see inside it again, or ever need the services of an attorney. After all, the very poorest would hardly expect such things, would they? Feeling almost as if she had slipped into a dream, Georgette stared hazily around the room. She let her eyes fall upon the two walls which were lined with shelves. There was not a spare space on any of the shelves, each and every one of them crammed to capacity with great leather-bound legal volumes and stated cases. The remaining walls were painted a rather dark and unappealing green colour, a sort of brownish green which, added to the fact that the windows were really rather small, made the whole room seemed cramped and somewhat airless. “You are very kind, Mr Wharton. In truth, I cannot say for sure that I shall be able to drink the tea, but I shall try nonetheless.” Georgette realized that she was being incredibly polite and wondered quite where she might need such manners in the future. Would she ever be in good society again? “It rather feels like the only comfort I can offer you, my dear,” he said and, judging by his expression of sad helplessness, he clearly meant it. “Mr Wharton, what on earth should I do?” Georgette said, just as the housekeeper bustled into the room carrying a laden tea-tray. Mr Wharton waited until his housekeeper had set their tea things and left the room before he spoke again. “I was not talking of setting up a school, my dear. As you quite rightly point out, you shall have no accommodations for such a thing. No, I was rather thinking of your perhaps taking up a position as a governess.” The moment he had finished speaking, the old attorney looked down into his teacup. “I had never thought that my life would come to this. I had never for one moment imagined that I would become a governess, a stranger in the home of others, no prospects nor even security. I can hardly bear it, Mr Wharton.” And, finally, Georgette Darrington began to cry. “I am terribly sorry, do forgive me,” she said between sniffs as she drew an immaculate white lace handkerchief from the long sleeve of her gown. “Then that is it, is it not? My future is set.” She shook her head in disbelief. She looked at the clock on the wall and could hardly believe that only twenty minutes had passed since first she had heard of her terrible circumstances. Only that morning, as she had prepared herself to visit her attorney for the reading of her father’s will, Georgette had found herself wondering quite what the future would hold. She knew that she would not miss her father a great deal, even though his passing had saddened her. He had never been a particularly warm man, and since her mother passed when she was but fifteen years, he had taken very little notice of her at all. But he had provided for her and provided well. He had ensured that she was as well-educated as her mother had always wanted her to be, and she truly wanted for nothing. Whilst she was not an ostentatious young lady, she knew that she had only to ask for a new gown and a dressmaker would be sent for. It was not a thing that she took great advantage of, but it had always been rather a comfort to know that she was well looked after. If only she had known the truth. If only her father had told her long ago of their troubles, then at least she would have had time to plan. She would not have so easily dismissed out of hand the attentions of many a suitable young man. Had her father been honest with her, Georgette would have realized the importance of being realistic, rather than carefree and most exacting in her wants concerning a husband. If only her father had given her that one thing. If only he had given her time, for surely that was not something he had gambled away also. “Do take a seat, Miss … Miss …?” Mr Shelford Winstanley, proprietor of the Winstanley Employment Registry, had clearly forgotten her name the moment she had given it. Had she described herself as the Honorable Miss Georgette Darrington, then perhaps he might not have forgotten it quite so readily. However, Georgette knew that when one was penniless and homeless, to describe oneself in such a way was simply ridiculous. “Darrington. Georgette Darrington,” she said, a little impatiently. “Yes, of course,” he said and smiled at her. He had rather a long nose, and his small, beady eyes were quite close together. All in all, Georgette rather thought that he looked like some sort of bird of prey. “And please do take a seat, Miss Darrington,” he insisted again, this time holding a chair out for her. Georgette had only ever heard of employment registries because that was where her father tended to procure servants for his own household. And he had always referred to such establishments as servant registries because, in truth, that was exactly what they were. Everybody of her acquaintance referred to them as servant registries, and she could not help thinking that Mr Winstanley was somehow trying to give himself airs or at least give his little establishment airs, at any rate. When she had first told her dearest friend, Henrietta Sheridan, of the dreadful circumstances in which she found herself, she had barely been able to speak the words. When she had finally come to tell Henrietta that she intended to find a good servant registry and offer her services in the hope of employment, she had simply cried. And Henrietta had cried also. “Is it really so very bad, Georgette?” Henrietta had said, dabbing at her eyes with a crisp white handkerchief as Georgette herself did the very same. “But surely there will be something left?” Henrietta had said hopefully. “And must you really go to a servant registry office?” Henrietta had said, stumbling over the words. “And, in truth, you will not be treated as one of the servants.” Henrietta, good friend that she was, had hurriedly dried her eyes and done what she could to appear optimistic. “So, Miss Darrington, what sort of work would you be looking for?” Mr Shelford Winstanley brought Georgette back to the here and now with his curiously high-pitched voice coupled with the dreadful scraping of his chair as he drew it back. “Governess,” Georgette said a little sharply, and then thought better of it. After all, she very much needed Mr Winstanley. Her pride was telling her that he ought to have known by her mode of dress and obvious genteel upbringing that she was not seeking a position as a housekeeper, but she knew she was simply being sensitive and that her sensitivity would do her no good in the end. “I am looking for work as a governess, Mr Winstanley.” She attempted a polite smile. “Of course,” he said, smiling back and seemingly unaware of her poor humour. “And have you recently left a position?” He leaned forward and, as he tipped his head down a little, Georgette thought his nose looked even longer. Georgette saw a smile pass fleetingly across his lips. In her world, never to have worked was a sign of status. In the world of Shelford Winstanley, it was likely a sign of uselessness. For a moment, Georgette pondered the differences of class. Work was unheard of in one, and its lack frowned upon in another. Well, since she was very much entering a lower social status, then she would have to accept all that came with it. “Oh, I see.” From the look on his face, Georgette knew that Mr Winstanley was finally gathering that her circumstances had taken a sudden and dramatic downward turn. No doubt, he had seen many a well-bred young lady who had suffered a similar fate coming through his doors. “But I can assure you that I have a first-rate education, Sir,” Georgette said, somewhat defensively. “I have no doubt, Miss Darrington.” Mr Winstanley smiled reassuringly. “And everybody has to start somewhere, do they not?” She knew he was trying to make her feel better but, in truth, it was not working. “Oh, so you do have a suitable position?” Georgette knew that she had snapped a little but could not quite take to his way of doing things. After all, if he had a suitable position, then why not simply say so? “Goodness me, whatever has gone so very wrong on three occasions? Surely there is something wrong with the place?” Georgette said, her mouth going a little dry as her common sense began to tell her that this was her only hope. “Such as?” Georgette said, not keen to be flannelled upon the subject. “Well, I have all four of those things at my disposal, Sir, and more besides. And as for the three Rs, I shall have no problem whatsoever in teaching reading, writing, and arithmetic,” Georgette said, thoughtfully. “And what are my conditions to be if I choose to take the position?” As nice as it was to discover that she had all of the necessary learning of her own to be able to pass on, the practicalities of her day-to-day life and her payment was going to be really rather more important to her, at least for the time being. “Well, I must say that the position is particularly well paid. Eighty pounds a year is being offered.” He smiled at her, and Georgette could hardly believe that he was, indeed, smiling. “Eighty pounds a year,” she said, her tone entirely flat. In truth, she could not believe that she would have so little. “But your conditions would be rather better, I feel sure. You would not necessarily be sleeping in servants’ quarters. Obviously, you would not be integral to the main living area of the house, but you would certainly be set a little apart from the other staff.” He smiled again. It was the very idea of being set a little apart that gave Georgette the very worst feeling. Being set apart would be a very good way of ensuring that she was never accepted by the other staff. And, in truth, she was not sure she would have a great deal in common with them even if she were not set apart. All in all, Georgette knew that the life of the governess was a life of limbo. A woman of good breeding suspended in a world where she could neither progress on her own account nor marry suitably well. She would simply be stuck there with the sort of pay that was so low she would never be able to save her old age. And, having very little time off and few connections, the idea of escaping such a life and into a suitable marriage seemed an impossibility. Add to that the fact that she would almost certainly be denied the right of simple friendship, even company, and she really wondered what, if anything, life had left to offer her. “And what of the family, Mr Winstanley?” Georgette said miserably. “The largest in Oxfordshire, Miss Darrington,” Mr Winstanley said and, despite the fact that this was clearly something of a problematic vacancy for him, he seemed suddenly puffed up with pride. “Oxfordshire, Sir?” Georgette said rather shrilly. In truth, she had not imagined that the position would be outside of London. “Draycott Hall?” Georgette said, silently trying to work out how many miles there were between London and Oxford. Not, of course, that it mattered a great deal. After all, there was nothing left in London for her to come back to. “Duchy?” Georgette said, her eyes wide with surprise. “A Governess for the Brooding Duke” is an Amazon Best-Selling novel, check it out here! When Georgette Darrington’s father dies suddenly and with serious debts, she imagines things cannot get any worse. But when her attorney tells her that the family home must be sold to pay the debts, leaving her penniless and without a home, her only choice is to become a governess. In no time at all, Georgette finds herself in the grand mansion of the Duke of Draycott, teaching his delightful, orphaned nieces. But, the more time Georgette spends with the little girls, the more she realizes they are missing their home and life in Wales, not to mention their own language. 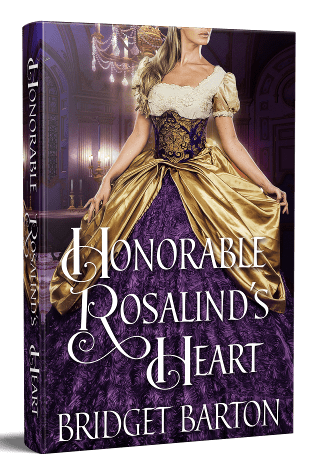 Georgette must find a way to convince the Duke to take an interest in the girls’ lives, and she must also find a way to keep their native language alive despite his determined instructions to the contrary. As the tragic tale of the Duke’s sister and her forbidden love unfolds, Georgette must struggle with the deprivations of her lowered status, not to mention the spiteful plots and schemes of a jealous housekeeper and nurse. 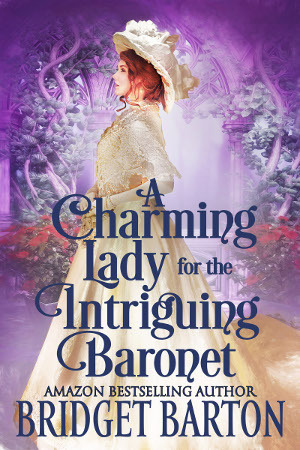 As her loneliness threatens to overwhelm her, Georgette must find a way put the splintered family back together, even as she battles her own feelings of love for the handsome, taciturn Duke. 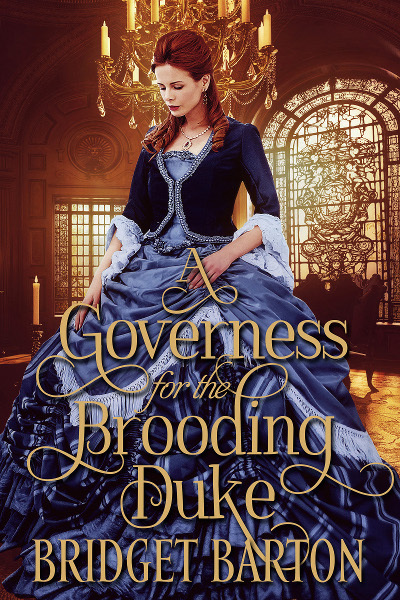 “A Governess for the Brooding Duke” is a historical romance novel of approximately 80,000 words. No cheating, no cliffhangers, and a guaranteed happily ever after.